Chris grew up in Aberdeen, MD and attended Aberdeen High school and graduated in 1984. He then began his journey in the military by joining the Army at age 18, as a Combat Engineer. He attended the Special Forces Qualification Course and then joined Special Forces,1st Group. 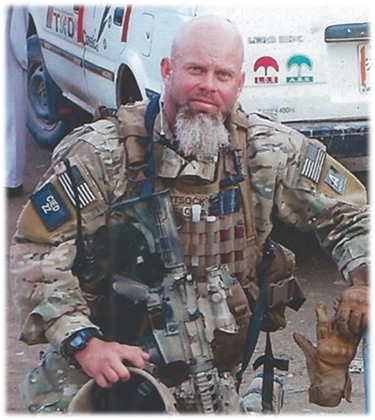 He served many tours over seas in Afghanistan, Iraq, Asia, and Europe. He retired in March 2006. He was employeed by CACI, as a Vehicle Optics Sensor System OP Lead. Chris was a very dedicated person to his career. He enjoyed hanging with friends at Bubba’s, riding his Harley, his Classic Chevy Nova, and if you know Chris his “BRO’s” meant everything to him. He would frequent Maryland to visit his parents and brothers as much as possible. He is survived by his wife, Ivy Hartsock and daughter, Alex Hartsock; brothers, Michael Hartsock, RobertHartsock, Alfred Hartsock and wife, Tina, all of Maryland; Aunt Shirley and Uncle Lonnie Bowman of Aberdeen, MD, and Uncle Roger Gompers of Mooresville, NC; He is also survived by several nieces, and nephews; his beloved bulldogs Stewie, and Elvis; and best friends, Noah Steere and Will Neilson.